Ardsmuir Prison, May 15, 1755. 60 men are suffering from La Grippe. 15 are badly off. Jamie is desperate to help his men but resources are scarce. The term Influenza comes from the Medieval Latin “influentia,” from the belief that epidemics of this illness were due unfavorable astrological influences. Influenza follows a seasonal pattern, peaking each year in the winter months. Additionally, worldwide pandemics occur approximately three times per century. Most famously, was the pandemic of 1918, termed the “Spanish Flu.” This illness had an extremely high rate of infection, with half of all those exposed developing symptoms, and generally severe ones. This epidemic killed approximately 2.5-5% of the world’s population. Many pandemics have been documented over time, including ancient Rome, Russia in 1580, asian influenza in 1958 and most recently the H1N1 (swine flu) pandemic of 2009. Whether termed epidemic catarrh, La Grippe, sweating sickness or the flu, influenza has plagued humanity for at least thousands of years. As we are all too well aware, influenza is a viral infection that causes fever, runny nose, body aches, headache, coughing, and fatigue. Symptoms begin about 2 days after one is exposed to the virus. For most people, symptoms last about 1-2 weeks and resolve, sometimes with a lingering cough. However, complications can occur such as viral pneumonia, secondary bacterial pneumonia, worsening of chronic medical infections, and in some cases, death. Those at high risk for complications include young children, the elderly, pregnant women, people with compromised immune systems and those who have chronic lung or heart disease. The problem with influenza is that a person is infectious for about a day before symptoms arise, so quarantine is not going to prevent transmission. The influenza virus is spread when an infected person sneezes, and another person in close proxmity comes into contact with those droplets or inhales them. It can also be transmitted from contaminated surfaces or direct personal contact like a hand shake, when a person then touches his or her own eye, nose or mouth with a contaminated hand. The virus can persist outside of the body on contaminated surfaces like light switches and door knobs for 1-2 days. Influenza outbreaks occur seasonally in the winter. This is thought to be because people spend more time indoors and thus in more close contact, promoting person to person transmission. Additionally, the virus survives longer on surfaces at colder temperatures. The annual influenza vaccine is recommended by the CDC to everyone over 6 months of age, and especially for those at high risk for complications of the flu including the young, the elderly, pregnant women and those with chronic diseases. The influenza virus has a high mutation rate so each year a new vaccine is developed to provide protection against the particular strains predicted to be circulating each season. When well matched to the strains circulating during an outbreak, the vaccine reduces the risk of influenza illness by 50-60% in the general population. The influenza vaccine reduces the risk of becoming infected with influenza and also decreases the severity of the symptoms of those infected. Also available today are antiviral medications. When started in the 48 hours of illness, these medications can shorten the duration of symptoms, reduce the severity of symptoms, decrease the length of hospital stay, and decrease mortality. This is of particular importance to those at high risk for complications of influenza. That doesn’t seem to be too difficult – eat well, rest, avoid close contact – unless of course, you are a prisoner of Ardsmuir Prison! Described by Jamie as “crowded cold squalor,” the prisoner cells of Ardsmuir seem an ideal breeding ground for an influenza epidemic. Avoiding close contact – this is impossible with cells packed with as many as 46 men, huddled together for warmth. Staying home when you are sick – not when “home” is a crowded cell with dozens of other men. Covering your mouth and nose when coughing/sneezing – well, yes, they can cover, but there are no disposable tissues and likely no extra cloths/rags to use as a handkerchief. And what cloth there was to use for this would not be washed regularly, if at all. Washing your hands – bathing occurred rarely, if ever. Water for washing was likely not much more readily available. Avoid touching the eyes/nose/mouth – again, unavoidable without the ability to wash regularly, and disease transmission would easily occur. Getting enough sleep – in a cold crowded cell, sleeping on the floor among dozens of other men, with the noises and movement inherent in a group that large, quality sleep would be hard to come by. Reducing stress – these men are in prison. On the contrary, they likely live with a persistently high level of stress – stress of not controlling their fate, of worry about their families, of no privacy, of insecurity about the future, about lack of food and warmth and their basic needs. Eating a healthy diet – According to Jamie, each Ardsmuir prisoner received 1 quart of oatmeal parritch and one small wheaten loaf of bread daily. Twice a week they would have thin barley brose and one a week on Sunday, a quart of meat stew. This is roughly 1600-1700 calories per day, supplemented twice a week with brose and once a week with stew. The daily calorie requirement for these men working 12-16 performing physical labor cutting peat would likely approach 4000, so clearly these men are significantly undernourished! Jamie does convince Lord John to allow the healthy men to set snares to catch additional meat to supplement the diets of the ill men. Avoiding crowds – impossible, as outlined above. Rest, good hydration and nutritious diet would have been a good place to start. Additionally, for those not in prison, it would be easier to provide a less crowded, warm environment, protected from the elements. Claire would have insisted on good hand washing, no doubt, and regularly washed handkerchiefs. She also would have had a few other tools at her disposal in the form of her collection of herbs and healthy foods. Vitamin D plays a role in immune function, and flu season coincides with the time of year when vitamin D stores are low due to limited sun exposure. Vitamin D enriched foods would be important to include in the diet, perhaps in the form of fish or eggs, if possible. Vitamin C has been used as a treatment for the common cold, though with conflicting evidence. However, some studies suggest vitamin C may be helpful in preventing colds in people who are exposed to cold weather or undergoing extreme exercise (sounds like our men of Ardsmuir! ), though it is unclear that this would also be a benefit in preventing influenza as well. Eating plenty of greens is an easy enough task and won’t hurt! In general, Claire’s approach would be similar to what we do today: stay home, get plenty of sleep, drink lots of fluids and take some symptomatic remedies, whether it be cough syrup and pain medicine, or eucalyptus and willowbark tea! Sadly, Lord John reports to Jamie that there are no medications to be had at Ardsmuir but does send word to a cousin who is married to an apothecary to see about acquiring some. Lord John’s kindness is evident but we are reminded of the desperation and despair that is imprisonment in the “crowded cold squalor” of this Highland prison. 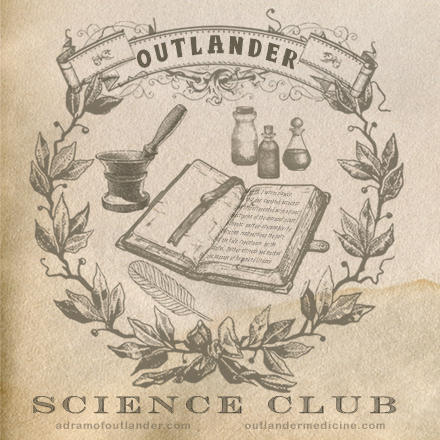 Listen to this week’s episode of Outlander Science Club HERE! Listen to this week’s podcast episode of A Dram of Outlander Voyager Read-Along HERE! Join in the conversation! Wednesdays at 6PT/9ET on Twitter, using the hashtag #ADoO! Comments, questions, suggestions, etc? I’d love to hear from you! Leave comments here or find me on Facebook or Twitter!